Life history: Rayek is anything but a dull character. From the moment of his birth, Rayek's life has been troubled. His name means 'child of the rocks', which aptly reflected the circumstances the Sun Village was in at that time. Rayek was born in a long period of draught, during which the Sun Villagers had great trouble growing and harvesting crops. His mother and father had little time for him, busy as they were tending to their gardens. Rayek himself never had heart or hand for tending crops, and roamed the crags and rocks around the village, teaching himself how to hunt and by chance finding out about his hypnotising and levitating powers. He brought back his kills to his parents, who praised him for helping out during the food shortage, realising that he had killed out of need. When Rayek was twelve years old, Leetah was born, and her birth was also the end of the period of draught. Rayek's parents no longer needed the meat he brought, and the bond between them, which was never strong in the first place, dwindled completely. Rayek considered Savah to be his mother in a truer sense than Jarrah, as Savah understood his powers and mentored him while he developed them. His attention was also taken up more and more by Leetah, who had stolen his heart as a small child by first healing a scratch on his hand before she was even born, and later healing his right arm, which Rayek hadn't been able to use for years after being attacked by jackals. 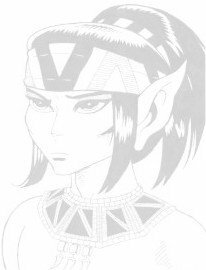 When Leetah grew up, she only became more and more attractive to Rayek; as the only girl in the village who understood magic powers like he did, she was the only one worth his attention. Rayek felt disdain for most of the other Sun Villagers, considering them worthless dirt-diggers, and even though Leetah sincerely loved him, she disliked his posessiveness, ambition and arrogance, and kept him at bay during the six hundred-odd years they spent together. Rayek's unique and treasured position of sole hunter of the Sun Village was shattered with the arrival of the Wolfriders, most of whom were hunters themselves. Worse even, their chief Cutter, who was no more than a flea-ridden barbarian youth in Rayek's eyes, had dared to Recognize his Leetah, something which was unnacceptable to Rayek, who therefore challenged Cutter to the Trial of Head, Hand and Heart. When Rayek was beaten, to his great shock, he first spent several days among the rocks around Sorrow's End, and after Savah had informed him of Cutter and Leetah's lifemating he left Sorrow's End and crossed the desert, feeling that he no longer had a place in the Sun Village. Remembering the Wolfrider's stories, Rayek searched for the Tunnel of Golden Light and made his first aquaintance with trolls. Even though he managed to outrun and outwit them easily, he became thoroughly lost in their tunnels and purely by chance found Ekuar the rockshaper in one of them. Moved to pity by the starved and half-crazy elf, Rayek took him into his care and the two have been inseparable since, each loving the other dearly. When Greymung's trolls were surprised and captured by Guttlekraw's trolls from the Frozen Mountains, Rayek and Ekuar followed them at a safe distance, hoping to find the Palace of the High Ones, but were confused by Two-Edge's rambling and ended up at the wrong side of the mountains with the Go-Backs. Rayek lovemated with their chief Kahvi and was still with the Go-Backs seven years later, when the Wolfriders and Leetah unexpectedly came back into his life. He helped during the war for the Palace and stayed in it after the elves won, spending most of his time reading the Scroll of Colours. In the three years that followed, Two-Edge was captured on a mission to steal Ekuar and stayed with the latter, with an unlikely friendship forming between the two. Rayek, meanwhile, contemplated the High Ones' fate and the mysterious Winnowill, whom he had never met, but whom he thought he understood. He planned to go to Blue Mountain to win her for his cause, which was winning the Gliders for him so they could help him make the Palace fly again. He delayed his departure however, as Kahvi was pregnant and there was a good chance the child would be his. It was, but Kahvi just wanted his child, not his influence on it, and told him the girl had died and that she wasn't his. Enraged at her cold-heartedness, Rayek left immediately, taking Two-Edge with him as a guide and leaving Ekuar in the Go-Backs care. His first encounter with Winnowill was quite overwhelming; she tricked him from the start and got him to work for her cause rather than the other way around, and he didn't realise it until he was woken up by Leetah, Cutter and Suntop. In the end he did get what he wanted though: when Blue Mountain collapsed virtually all the Gliders died, and Rayek guided their spirits back to the Palace, he himself being led by Clearbrook and Treestump to keep him from going mad. The Gliders' spirits gave Rayek more power than he had ever had: where he could float little more than twice his own weight before, he now easily floated both Clearbrook and Treestump and their wolves, and when he arrived at the Palace he found the Go-Backs fighting the trolls again. It turned out that Ekuar had wandered off and had been captured by the trolls, something which made Rayek so angry that he used his power to cave in the Go-Back's lodge, almost killing Kahvi, her daughter and Kahvi's sub-chief Urda, and driving the Go-Backs themselves away, separating them from the Palace by burning a great rift into the ground. After that he lost control over the spirits, who hurtled themselves at the Palace. The Gliders' combined spirits restored the Palace to its former glory, and Rayek discovered that he could indeed fly it now. He used his new-found power first to fly the Palace to the Wolfrider's holt, in answer to the cry for help Suntop had heard. He then whisked the entire tribe to Sorrow's End, where a band of travellers was assembled to go to the new land where the cry had come from. Once arrived, the elves eventually found out that the cry was an echo of the cry of the High Ones, emitted centuries ago when they realised that things were going wrong. Rayek realised that he could fly the Palace through time as well as through space, and in his characteristic arrogance he decided that preventing the accident by merging his Palace with the one that would appear for a few seconds in the future before being hurled into the past would be best for all elves. In his opinion, the accident had crippled the elves, tainting them and making them less than they should have been. Cutter disagreed and forbade Rayek to do it, but Rayek ignored all arguments and flew the Palace into the future without further warning (and with a little prodding from Winnowill), taking Leetah, Skywise, Ember, Suntop, Ekuar and Picknose's little troll daughter Trinket with him. Once arrived in the future, things didn't go exactly as planned. He took Leetah with him, flying to Winnowill so she could be fully healed, but Leetah physically hurt him so much in her rage about being robbed of her lifemate that he dropped her. When he met up with Winnowill again, he summoned the Palace to him and hypnotised Winnowill, again attempting to take Leetah with him to heal her, this time using Skywise as a bait. Winnowill, however, awoke again the moment the three arrived and attacked them with water-rams. Rayek floated to the surface and was met there by Venka, the daughter whose existence he had never even been sure of. Together they subdued Winnowill, but time was running out and Rayek couldn't collect the Sun Villagers anymore, which meant they would be erased from existence if he merged the two Palaces. When he also found out that Ekuar intended to be wiped out with all the other elves outside the Palace, and that all the Wolfriders were still alive, Rayek found himself unable to wipe them out, and the moment in which he could have saved the High Ones passed. This event had a great impact on Rayek. He had failed to prevent the accident, had failed to inspire his people to seek a better life (at least better in his own opinion), and this utter failure made him lose all his magic powers. The struggle to regain them was a hard and laborious one, and it was six years before he had found faith in himself again. However, he found that Cutter opposed him in all possible ways, never having forgiven Rayek for separating him from his family for so long, and Rayek decided that a challenge would be the only way to settle the matter. During the fight Cutter showed Rayek what exactly had been done to him, and Rayek allowed himself to be almost killed to give Cutter what he needed, at the last moment thanking him for raising his daughter Venka. The matter was now settled between them, though Rayek and Cutter still couldn't like each other. That Rayek's nature hadn't changed either soon became apparent: when Winnowill woke up, stole the Palace and was then mentally torn off it again so it crashed and shattered, Rayek wanted to go and do something immediately after hearing that humans were gathering up the shards. Cutter forbade it, as showing themselves to the humans meant giving the holt away, and for once Rayek listened and strained his patience to the limit. Rayek spent most of the war with Grohmul Djun in mental combat with Winnowill and when she finally met with Timmain, she realised she could never win while alive and convinced Grohmul Djun that he should kill her, which he did by cutting her head off. Before she could do anything, however, Rayek drew her spirit into himself, thus trapping her and condemning himself to eternal wandering to keep his people safe and to keep her raging spirit in check; the greatest act of love he has ever shown. Ekuar, ever the loving companion, accompanies him on this endless journey. Although it may seem so, Rayek isn't evil. He is just motivated by his own extreme ambition and doesn't understand that it is not right to take decisions that have great impact on other people's lives without their consent. He is truly amazed that other people cannot want the same things that he does, something which is actually quite tragic.